In an upgrade from CRM 2011 you may want to preserve the add activity buttons on a form. This post describes how you can easily bring back those add activity buttons using the Ribbon Workbench. 1) Create a solution containing the entities that you wish to restore buttons for. I am using the Account entity for this post. 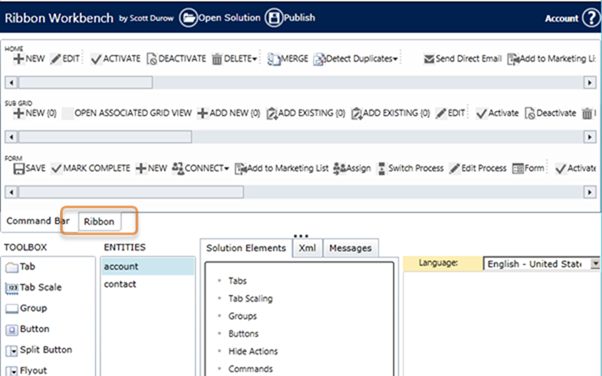 2) Open the solution containing the Account entity in the Ribbon Workbench for CRM 2013 and select the 'account' entity if not already selected. You will see by default the Command Bar is selected. 3) Select the Ribbon tab to show all the buttons that are defined. 4) Select the 'Form' ribbon using the drop down in the top right corner of the design surface and then select the 'Add' tab. 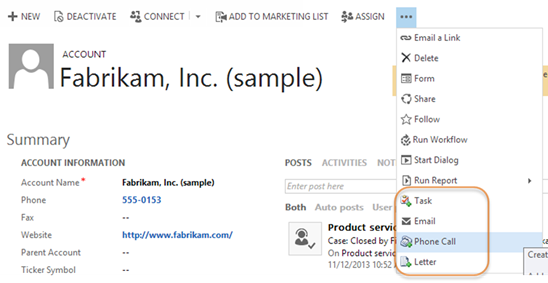 You should now see the CRM 2013 activity buttons. 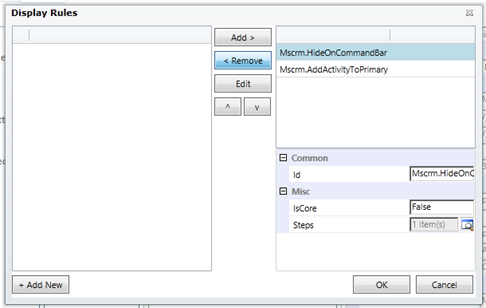 7) Select the 'Mscrm.HideOnCommandBar' rule and click 'Remove'. If you do not see this rule, then it is likely that you have forgotten to select the 'Form' ribbon in step 4 above. 8) Click OK and then repeat for each of the add buttons that you want to restore. 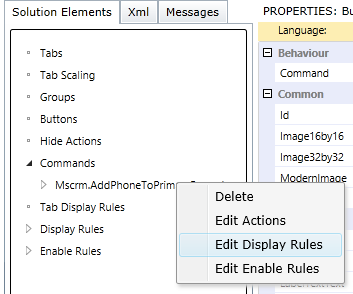 9) Since we are not customising the enable/display rules – only the command, expand the Enable Rules and Display Rules node, and for each rule that is prefixed with Mscrm, select and set the 'IsCore' property to 'False'. 10) Click 'Publish' and your form should now show the activity buttons who's command's you customised.